Flaming PC Brigade can't leave anything alone! First it's a female Dr. Who next there's talk of a female James Bond. Unacceptable! 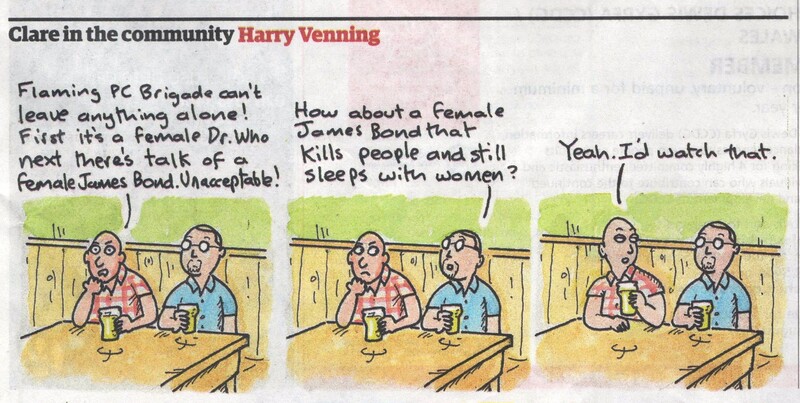 How about a female James Bond that kills people and still sleeps with women? APA 6th ed. : Venning, Harry (2017-08-06). Clare in the Community. The Guardian . MLA 7th ed. : Venning, Harry. "Clare in the Community." The Guardian [add city] 2017-08-06. Print. Turabian: Venning, Harry. "Clare in the Community." The Guardian, 2017-08-06, section, edition. This page was last modified on 22 February 2019, at 00:17.